If neither deliverance nor the principles seem to work for you, you may have been captured by an Antichrist spirit, often through no fault of your own. Cost includes 428 days of access after purchase date. Many people go for deliverance and with some experimentation they find a practitioner who has the key they need. Millions of people have been set free through deliverance. There are others who have been going for deliverance for decades and it seems as though nothing ever happens for them. The same is true for principles. Some people invest and see immediate fruit and others invest massively and don’t see fruit. There are various reasons for these dynamics but one of the least known is the Antichrist spirit. The Antichrist spirit hides within a sound proof chamber to escape eviction, and from that place is able to cause a life to be barren. This teaching explores the ways the Antichrist spirit can come into someone’s life through no fault of their own. During Holy Communion, Arthur models deliverance from the sound proof room. This teaching just unlocked a hidden space in my soul. I've been to deliverance counseling in person twice, and listened to many online speakers regarding deliverance. They have all had great success! Until I realized my stuff was returning. Not all of it, but enough to stay defeated, condemned, shame filled, and powerless. I listened to this one last night. It was the best 1 1/2 hour, $7 investment I have made yet! If you wonder why some people go multiple times for deliverance, and seem to quickly backslide into some old patterns, please take the time to listen to this. During my previous deliverance counseling, I did not manifest any symptoms. Yes, I felt more freedom and calm when they were over, but as this teaching exposed yet another spirit tribe, "antichist", I felt like my physical body was experiencing an anxiety attack, but my mind and spirit were completely calm and strongly courageous to push it out! It reminds me of Jericho falling as the Israelites blew the trumpets and shouted! Victory! I've never taken a more powerful cup of communion as I have during this livestream. The word of God was presented with passion and power as the familiar stories from the Bible came from a fresh and new perspective. I felt like my perspective was aligned with God's during this livestream and hope flowed. My heart was touched in a very deep place and I am amazed at how easy it is to connect with Jesus Christ in the daily things of life. 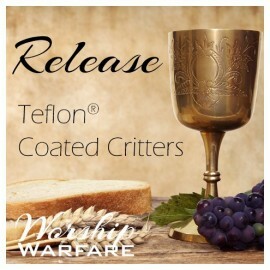 I highly recommend the Release series but Teflon Coated Critters touched me most deeply. This warfare is truly a volcano of epic proportions! I had an idea of the antichrist spirit hindering but this superb rich weaving together of His Word together with Revelation is so powerful. Thank You Lord for everything You do in our tribe to shatter what the enemy set up. Your power can break it in a moment, exploding all the damage of the past. I rejoice in my Powerful God who can and DOES act to redeem. His hand is mighty to save! Thank you Arthur for pushing through, never giving up and setting an amazing example for us all. This was more skillful sword than just another teaching, cutting through enemy bindings and shattering hiding places long held. I hope many will hear and be transformed into the beautifully designed paths from alienation to fruitfulness, abundance and fullness of God-breathed intimacy - from experiencing Father from a distance to barriers removed for a satisfying, richly emotional relationship with Him - and finally freedom from relentless discomfort in feeling unanchored to a depth of belongingness unimaginable. Jesus Christ enthroned! The very sound of heaven shattering the inability to believe! I am so grateful for this and I am impacted to my core. 4 out of 4 people found this review useful. Wow, wow, wow! What a superb combination of teaching, warfare, communion, coursing on the piercing, passionate truth of God’s Word! The richly instructive enlightenment about antichrist spirits is the best I’ve ever heard, identifying, laying out the effect on individuals whether from a generational or social context, making the often vague concept of “antichrist spirit” not only clear and real, but also providing practical substance. But… oh, my… along with the rich soul food is the immense, intense sound of heaven flowing in the spirit that begins as an undercurrent and swells into a raging tide! What a huge, power-packed dose of passionate truth flooding through streams of Scripture while expounding and expanding it, literally shattering the enemy’s hiding place and hold. Oh, my… oh, my….. I wish I could articulate justly the impact of this live stream… and there is no way to adequately describe the impact of the communion. The communion portion of all the live streams is always a deeply special and highly impactful experience. This one is certainly no exception, and is particularly passionate! Huge. So cleansing, so freeing, so restoring…. No words for it, yet the spirit knows and rejoices…. Thank You, Lord. And thank you, Arthur. I flipped a switch and nothing happened in the room. Not being an electrician, I don’t know what to do. Many people are blocked in their lives, but have no clue why. After all, they are running hard after God. It may be the Antichrist spirit. It is cunning and sly. We respect your Inbox. So, you may sign up for as little or as much as you wish. All of these resources are free. Simply check the boxes below and enter your e-mail address.